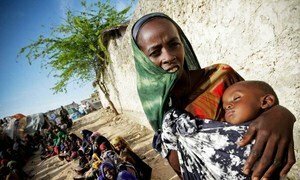 For many months United Nations aid agencies have warned of an impending crisis in the Horn of Africa as drought, failed harvests and fighting in some areas led to increasing food insecurity. Now conditions are so grim that the UN has turned to a word it uses sparingly and specifically – famine. Yesterday the UN Office for the Coordination of Humanitarian Affairs (OCHA) declared that a famine exists in two regions of southern Somalia, and warned that the famine could soon spread to the rest of southern Somalia. While many countries worldwide face food security crises, with large numbers of people hungry and unable to find enough food, only rarely do the conditions meet the humanitarian community’s formal criteria for a famine. The last time it was used in Somalia, for example, was in 1991-92, despite several periods of protracted drought and other problems in the intervening years. A famine can be declared only when certain measures of mortality, malnutrition and hunger are met. They are: at least 20 per cent of households in an area face extreme food shortages with a limited ability to cope; acute malnutrition rates exceed 30 per cent; and the death rate exceeds two persons per day per 10,000 persons. Other factors considered in these areas of Somalia include large-scale displacement, widespread destitution, disease outbreaks and social collapse. The definition has been developed through the work of the Integrated Food Security Phase Classification (IPC), which includes specialists from humanitarian agencies, including the UN Food and Agriculture Organization (FAO) and the UN World Food Programme (WFP), as well as leading non-governmental organizations (NGOs) and Government aid agencies. The gathering of data to determine whether the criteria are met is in this case in the hands of the UN-backed Food Security and Nutrition Analysis Unit-Somalia (FSNAU), which is administered by FAO. FSNAU then passes the information to the UN, aid agencies and the United States Famine Early Warning Systems Network (FEWS NET). According to WFP, famines have been declared previously in southern areas of Sudan in 2008; in Gode in the Somali region of Ethiopia in 2000; in the Democratic People’s Republic of Korea (DPRK) in 1996; in Somalia in 1991-1992, and Ethiopia in 1984-1985.